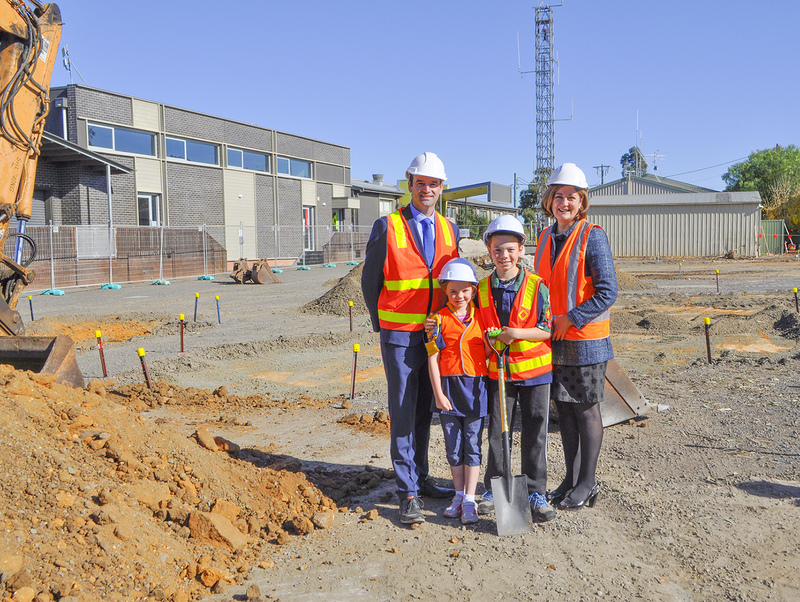 Mayor Cr Owen Sharkey and Federal Member for Corangamite Sarah Henderson MP turned the first sod to get construction works underway on Stage One of the Bannockburn Heart Precinct today (Friday 12 April). Representatives from the Bannockburn Scouts and a local stall-holder of the Golden Plains Farmers’ Market were also excited to visit the site and see the construction. Stage One of the Bannockburn Heart Precinct will create an attractive and welcoming community civic space that celebrates the region’s heritage and culture through performances and events in the centre of Bannockburn. Constructed over two stages, the Precinct will transform and activate the CBD, improving liveability, retail spending, and amenity. Stage One of the Bannockburn Heart Precinct will cost $3 million and the project is fully funded by Council, a $1.2 million Australian Government grant; and $566,500 in grants from the State Government with $500,000 from Regional Development Victoria and $66,500 from Sport and Recreation Victoria. The project is scheduled for completion in summer 2019. Paved plaza, lighting, and landscaping. Power upgrade at the site. At its February Ordinary Meeting, Council awarded the construction contract to Rendine Constructions Pty Ltd. During construction, every effort will be made to minimise any disruption or inconvenience to residents and centre users. Mayor Cr Owen Sharkey says Council is proud to deliver Stage One of the Bannockburn Heart Precinct in partnership with $1.2 million from the Federal Government and $566,500 in grants from the State Government. “The Bannockburn Heart Precinct has been many years in the making and Council is very excited to break ground on delivering the Stage One works for the Golden Plains community by this summer. “With the Bannockburn Scouts and Bannockburn Playgroup in their homes and the underground power upgrade switched on, Stage One features the construction of the water and adventure play, active recreation equipment, public toilet and seating, BBQ facilities and shade, upgraded site for the Golden Plains Farmers’ Market; and paved plaza, lighting, and landscaping. “Constructed over two stages, the Bannockburn Heart Precinct is a wonderful community project for the residents of Golden Plains Shire’s largest and fastest-growing town. The precinct will create 22 jobs during construction, generate more community events and increase spending in the town centre, grow the Golden Plains Farmers’ Market; and encourage physical activity and positive health and wellbeing outcomes. Pictured above are Mayor Cr Owen Sharkey and Federal Member for Corangamite Sarah Henderson MP with Bannockburn Scouts Frankie and Michael Jales at the sod-turning of Stage One of the Bannockburn Heart.